Produce endless coins from the air, and hear them fall in this tumbler! 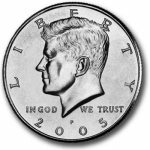 Imagine producing coin after coin from thin air! 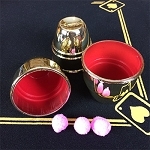 This professional coin tumbler, with built-in coin delivery system, makes it possible! Show both hands empty, then pick up this tumbler from your table. Instantly you start to to pluck coin after coin from the air. Coins from everywhere- each making a loud ringing as it hits the tumbler, to prove you've really dropped the coin inside. Pull coins from a spectator’s ear, nose, pocket- even let the spectator himself "catch" a coin from the air and drop it into the tumbler- hear it clink! 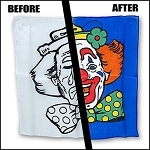 The cleverly constructed gimmick attached to the tumbler lets you perform this classic miracle with only a minimum of practice to get your routine smooth. 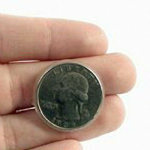 And you can use half dollar sized coins or quarter coins (use your own coins- no coins are included). 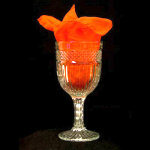 You can also use the glass to vanish a borrowed coin for later production from another prop. 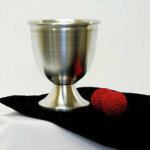 You'll get the special stainless steel tumbler, with instructions. You supply the ordinary coins. Use quarters or half dollars. 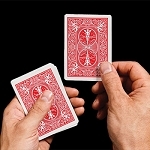 Half dollars are available from MagicTricks.com. 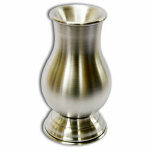 Tumbler is made of polished aluminum. About 6" high. 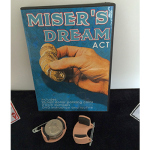 Great Mini Prop for the Classic Miser's Dream!!! 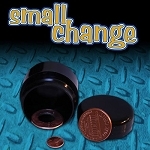 Better for close-up Magic then the usual ice pail size prop, this little beauty also overcomes the awkward problem of getting all those coins back up out of the pail for additional production. Now you can produce a seemingly endless array of coins while secretly only needing a few. 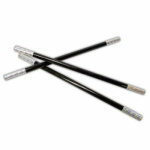 When doing Street, Fair or Festival Magic this makes an excellent Draw Trick. 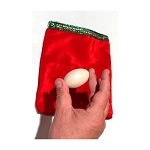 As potential spectators go by, perform the Miser's Dream right in front of their eyes, when they come to the table, drop the cup into your dump bag or pouch (it's small size allows you to conceal it easily) and then jump right into your full coin routine using the coins you magically produced. 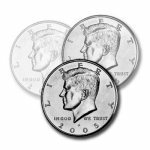 Can't beat the price, looks great, nice loud clink, for better audience visibility I recommend you use the Kennedy Silver Half Dollars sold here at MagicTricks.Com. 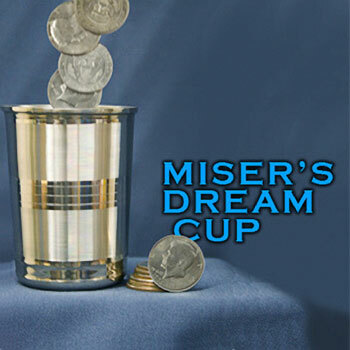 Don't know the Miser's Dream routine? No Problem! 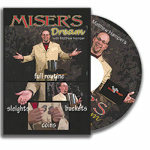 Just pick up a copy of the DVD - Miser's Dream Secrets Revealed, another great product sold here at MagicTricks.Com.